Check in with free streaming tv episodes, tunes and talk shows with BBC iPlayer & catch up with tv shows youve missed. The BBC iPlayer website is essential for anyone that wants to watch TV online, even those that dont should use this website. It offers totally free (although licence fee payers pay for it indirectly) TV shows and movies from the last seven days, has a download option for offline viewing, a series link to record all episodes etc. Just enjoy what catch-up TV is all about and enjoy. The BBC iPlayer - released into the public domain 2007 - is an on-line television, radio service streaming website and downloadable application which can be accessed by PC, Mac and tablet users. The software had been created by the BBC in order to enhance its previous real-player so that the content available to internet consumers actually encompasses whole movies and television programmes. In regards to what the player offers, it broadcasts what has been shown live on BBC TV and Radio in the preceding seven days. In 2011, the BBC broadened its content to include programmes from other channels as well. Thus, it provides links to a wide variety movies and programmes from ITV1, ITV2, ITV3, ITV4, Channel 4, E4, More 4, Film 4, Channel 5 and 5* as well as 5USA. In the same year, too, the BBC launched its iPlayer mobile app on Android and Apple's iOS software. Great though iPlayer is, nobody likes buffering, stuttering and slow-downs while watching content. To combat this the BBC let you not only download content to your hard drive, but click a series link button and it will record the whole series of shows for you as well. To use the download option you will be prompted to install the BBC iPlayer desktop application. Then you can either watch or download any piece of content, options include Windows media player version or you can download a much smaller file for mobile devices, but this option can be used to quickly download a show and watch on your PC as well. iPlayer is not just about catching up with TV shows, click the TV button and your presented with a list of all BBC channels and an EPG so you can watch what is on live. You can scroll back and forth through the planner and even go back several days then watch the show you select. If you start watching a live stream and the programme is part way through you can now zip back to the beginning using the Live Restart feature. This only works for BBC channels and will only rewind by 2 hours maximum. If you want to watch non-BBC channels then click the other TV channel button and your presented with other UK terrestril channels. Content that can be watched online is highlighted and clicking on any show that has a stream option will send you to the relevant website for that channel such as ITV Player etc. You can also listen to the full range of BBC radio stations. The beauty of iPlayer is that unlike its broadcasting competitors like ITV, Channel 4 and Channel Five, using the iPlayer service and watching downloaded content is totally ad-free and without breaks. Browsing and the functionality of the iplayer website is a breeze. You can search programs by popularity, by category or use the search to call up content. Each show that is available gives a description and the option to start watching. Due to content restrictions from the music industry you are not able to download and listen to radio shows. So your only option is to listen to them live. The BBC iPlayer website and application is a great example of how streaming content can revolutionise watching TV. If only the BBC could offer it's entire archive of content i could die a happy man. The restriction of only having the last seven days of content available aside, the iPlayer is a must-have bookmark even for those with slow Wi-Fi thanks to the download feature. 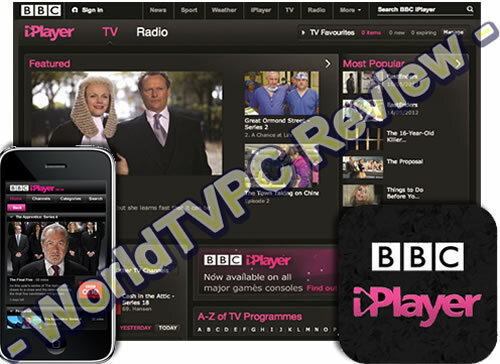 The BBC have made iPlayer available on every connected device from smart TV to phones, tablets and game consoles. There is no excuse for TV viewers not to be using this regulalry. Review: Thanks for the article. For those who live outside UK and want to access BBC iPlayer, you can use UnoTelly as I do to get around the geo block. Review: I use this on my iPhone and it either never loads the show or it keeps stopping while trying to load more content. I just dont bother with it now, when will they make it work better? Review: I love the iPlayer because it is slick, fast and lets me download to my PC and watch when im offline. The problem with streaming TV is that the buffering keeps slowing down the stream and pausing it. Then you get a lousy quality if your broadband is not so fast, so to be able to download is a godsend. Summary: Looks nice IF you are in England. Review: You need to be in England for this. Review: The best catch up tv around imo. Just caught up on some shows using my iPhone. You cant watch other TV shows on iPhone so i am in love with this service.